Technology!? You either love it or hate it, but one thing is for certain, it can make life easier, especially traveling in your RV. Finding the cheapest gas, making campground reservations, and mapping your way have never been easier. 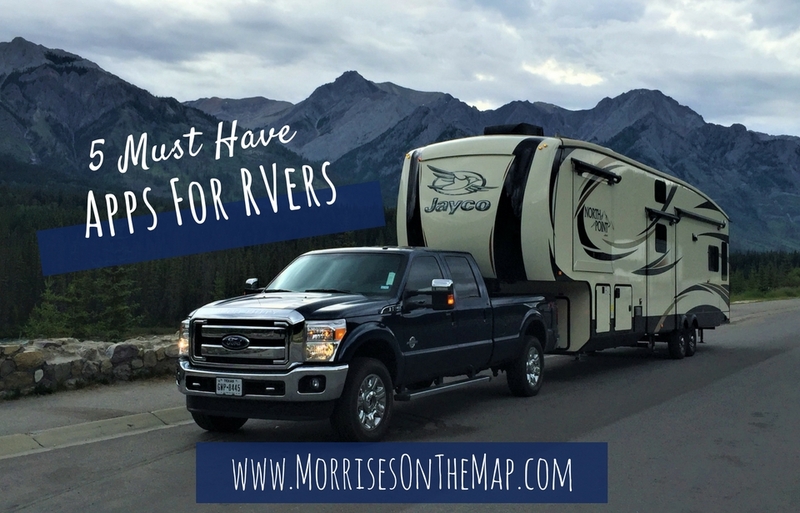 As we prepare to set out on a 3-week RV road trip we thought we would share 5 apps we use that make our lives easier before a trip and while traveling. If you have a Big Rig, this is a must have app.We started using this app after we bought our fifth wheel and have found it to be invaluable. Created for truckers, the app will map your path, show you the locations of truck stops, and warn you about low clearances. It will also point out Walmarts and rest stops. Last summer when we spent six weeks driving from Texas all the way to Banff, Alberta we would sit down the night before a travel day and enter our destination into the app. Before we would even leave for the day, we would have our fuel and picnic lunch stops already mapped out. We felt so much better knowing where we were going to stop and not having to search while we were driving. Several times on our trip, we changed our route because the Trucker Path app pointed out there were low clearances along our projected path. It saved us so much time and grief! RV travel can be expensive, and one of the biggest expenses is fuel. The Gas Buddy app allows you to find the cheapest place to get fuel. When pulling our fifth wheel, we try to stop at truck stops just because it is easier to get in and out. The night before we leave or while staying in a location, we look for the cheapest place to buy diesel. We always use Gas Buddy to save us time. Who really wants to drive around looking for cheap fuel? Just open the app and quickly find the closest station with the cheapest fuel. We have GPS in our truck, but it is not as easy to use as Google Maps. Typically, we will enter our location in our truck GPS and in Google Maps to compare the path each one gives us. The number one reason we like Google Maps is the satellite image view. We pull a 43ft 5th Wheel and that makes parking sometimes a little tricky. We have used the satellite view to check out parking lots before we pull in. We started using this view after pulling into a Whataburger parking lot on IH10 with our 34ft travel trailer and sideswiping another car, because the parking lot was so small. That was an expensive trip to Whataburger! So now we always use Google Maps to check to make sure there is enough room for us before we even get there. We enjoy staying at KOA campgrounds. So much so, we even lived in one for almost a year while building our house. We have always been pleased with the amenities offered at the parks, the cleanliness and the friendliness of the staff. We have not found one yet that does not offer big rig spots, and they often offer cabins if you are traveling with friends or family who do not have an RV. The KOA App allows us to enter a location and find the nearest KOA. You can even make reservations right from the app. If you stay at KOAs often, you can join the KOA Value Card program for just $30 plus tax. As a member, you will get 10% off your daily rate. You can also accumulate points and receive free nights. All of these can be tracked using the KOA app. When making reservations, we also like to use the Good Sam App. To use the Good Sam App, you must join the Good Sam Club for $27 a year. By joining Good Sam, you can save 10% at any of the 2,100+ Good Sam RV parks and get discounts at Camping World, Flying J and Pilot Travel Centers. When using the Good Sam app, you just type in a location, and it will give you a list their campgrounds in that area. It also will give you reviews of the campgrounds. Typically, we can always find a Good Sam park near any location we are wanting to stay, and we have never been disappointed in any of the Good Sam parks we have visited. You cannot make reservations within the app, but it does give you links to the campground website and contact information. These apps have helped us keep our RV travels as stress free as possible, and we hope they will help you too. If you have an app you have used while RV traveling, we would love to hear about it. Make sure you leave us a comment! We are not getting compensated in any way for sharing these apps…we just really like them! Thanks. Looking forward to your newsletters. The aps info has already been helpful. Love you guys. So glad the app info was beneficial! Happy travels and we love y’all too!